For any otaku who didn't know, Japanese music artist Gackt is in fact Genesis from FFVII Dirge of Cerberus and the recent Crisis Core game. Character designer Tetsuya Nomura is a big fan of his work and had him create his song "Redemption" for Dirge of Cerberus. If I'm not mistaken, Gackt even did the Japanese voice for Genesis in Crisis Core. 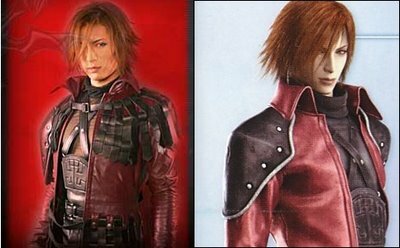 It is also rumored that FFVIII's Squall was also based on Gackt. It'll be great to see him again when Square-Enix makes the next installment in the Complilation of FFVII series. I also attached the Redemption video for you all to see.